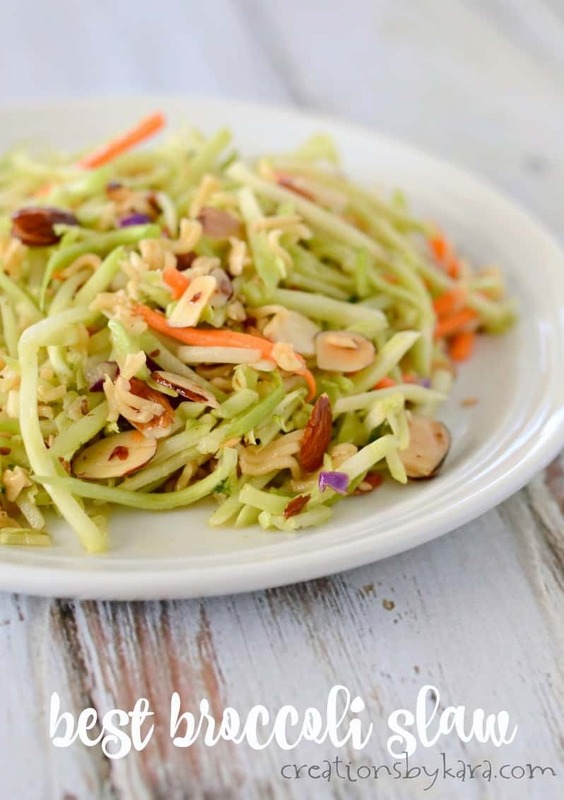 Broccoli Slaw . 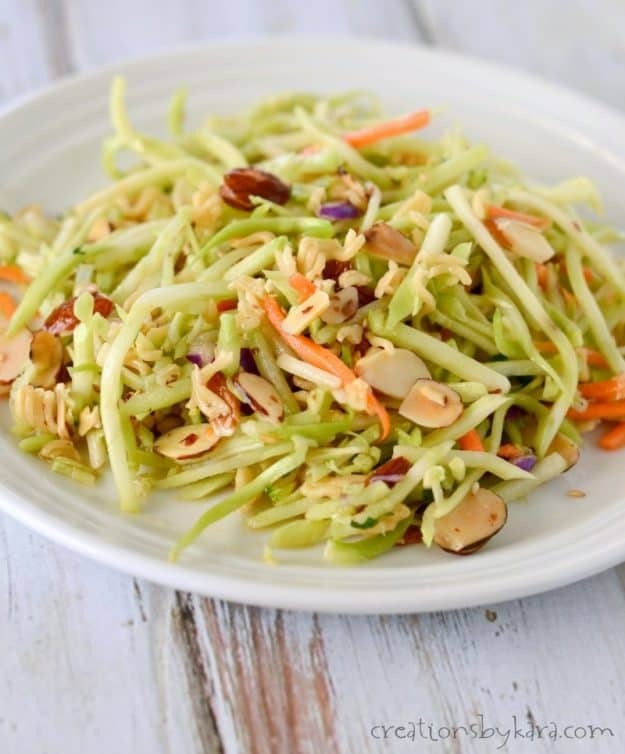 . . this healthy and delicious Oriental salad is packed with flavor and texture. It’s perfect for potlucks or just family dinners. Can I just mention again how excited I am about going to Creative Estates this weekend? It’s in Arizona. Nice, warm Arizona. I’m pretty sure that unlike my town, they did not wake up to 7 inches of snow yesterday. Grrr. I am soooo done with snow! So today I am sharing a nice summery recipe. Oriental Salad. Which can of course be made any time of year. I got the recipe from my friend Tamera, and made it for the first time a couple weeks ago. Oh. My. Gosh. It is amazing! I think I ate almost half the bowl by myself. 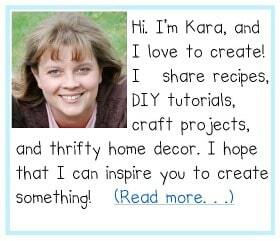 I am actually contemplating making a trip to the store today just so I can make another batch. It’s that good. Broccoli slaw is a little tricky to find, but my local Walmart carries it. It’s usually by the coleslaw and bagged salad. 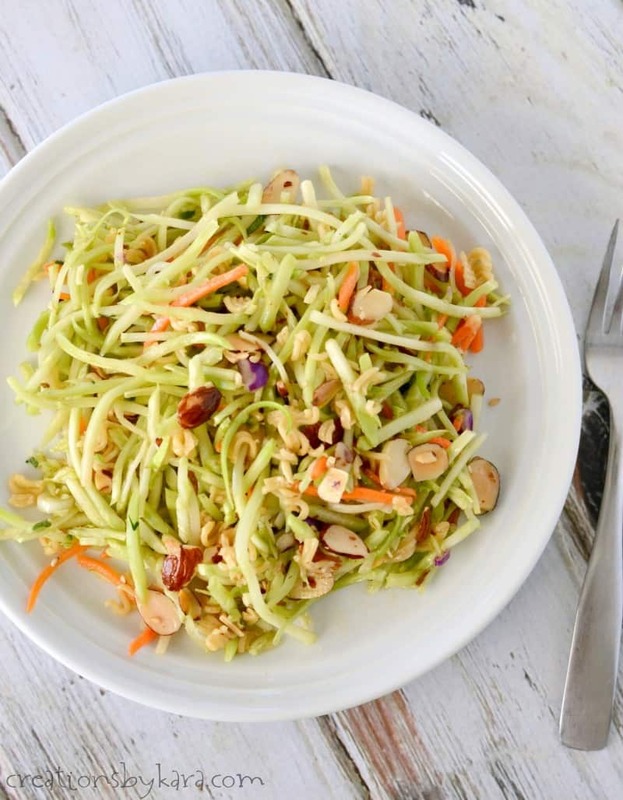 Toasting the ramen noodles and almonds gives this salad an unbeatable flavor and crunch. It’s so colorful, and so yummy. One of my favorite salads ever, seriously. You’ve gotta try this stuff! When I make it for my family, I usually make half a batch. Some people like to let it sit before serving, but I think it’s best when you add the dressing and toppings right before serving. Enjoy!! 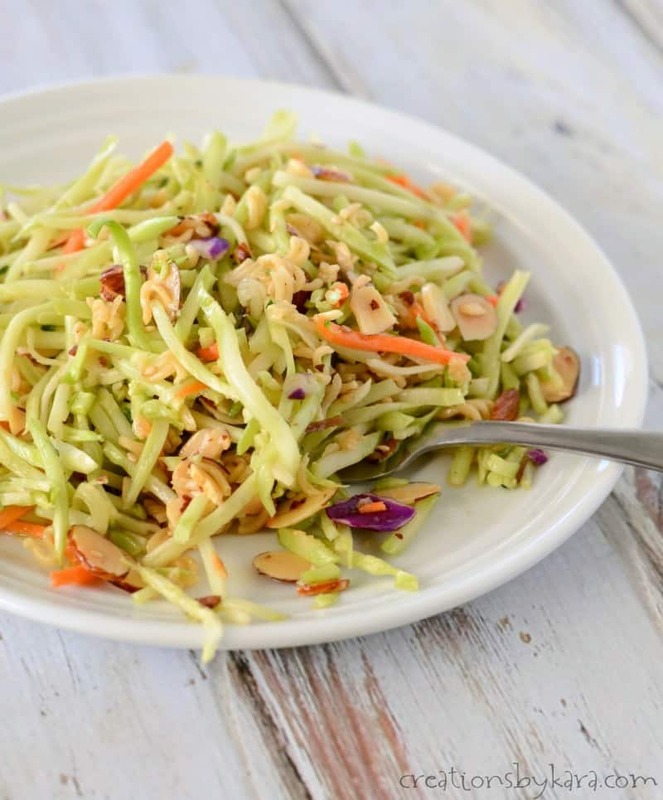 Crunchy oriental salad made with broccoli slaw and Asian dressing. Crumble the ramen noodles onto a pie plate. Stir in the almonds, sesame seeds, and melted butter. Bake at 350° until golden brown, about 8-10 minutes. Cool completely. Whisk together the dressing ingredients in a small bowl and set aside. Toss together the broccoli slaw and the green onion in a large bowl. 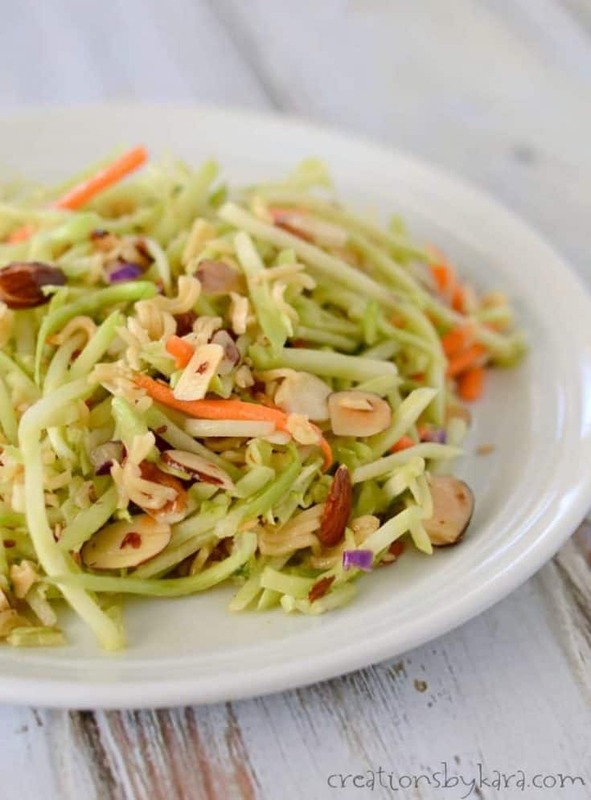 Add dressing and cooled noodle mixture to the slaw. Stir till well coated and serve immediately. Do you toast the ramen noodles without boiling them first? Like straight out of the package. Yes, straight out of the package. Definitely don’t boil them. They are what adds a yummy crunch to the salad! This is one of my favorite salads!!! It has so much flavor & is super easy to make! It’s the perfect side dish or meal! I like to add chicken to make it even more hearty! Love the idea of adding chicken, I’ll have to try that! LOVE the flavor! Already craving it again. High five to your friend Tamara for 1st making this salad, which got you hooked and you posted here. This salad is pretty amazing. Made it for a road trip, leaving Saturday….hubby tasted it and it became his dinner Friday evening. Only had a small container for the road trip. He asked me to make it again. Thank you.